It’s that time of the year again, when family and friends re-unite and different generations come together. It’s time to cozy up for storytelling sessions, play fun games, like Thanksgiving scavenger hunts, and feast on scrumptious food with loved ones, there is hardly a thing to complain about this holiday. While the holiday itself is heart-warming and joyous, there is a small nagging detail that most people dread completing – organizing the party and cleaning up afterwards! Cleaning up after a festive celebration is never fun, especially if it is a big Thanksgiving dinner that involves piles of food. Organizing a Thanksgiving party also comes with its own challenges. With menus to decide, games to plan, food to cook, and more, organizing a Thanksgiving dinner is no small job. Everyone looks forward to a hassle-free celebration and it is only fair to ask your family to help you plan as well as make it happen. Planning the Menu – Mention the words ‘Thanksgiving Dinner’ and the first thing that everyone thinks about is the turkey. If only organizing the feast was as simple as putting a roast turkey on the table! What would people like as sides to go with the turkey? Do people like milk with their mashed potatoes? Are there any vegetarians coming over? What would be a turkey alternative for them? Do they like runny or thick gravy? What about dessert? Are people tired of the same pudding you make every year? Get one member in the family to do a survey at least a week in advance and ask all these important questions related to the menu. Then ask the same person to chalk out a tentative menu that you can mull over before going grocery shopping. Setting the Table – When planning a party or a feast, expect the unexpected. A dish is likely to be undercooked or an ingredient is sure to go missing. Often, sorting last minute accidents can take up the time you previously allotted to serve up and set the table. Get another family member to step in! While you are busy carving the turkey, another family member can take the cookery to the table, set the table, etc. 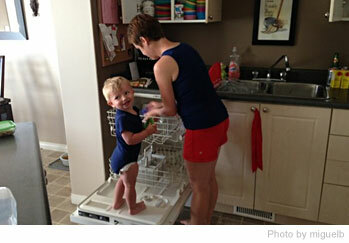 From fetching clean plates to finding matching spoons and forks, there is a lot to be done. Get help! Cleaning up Afterwards – If there is only one area that you can get your family members to help you with, let this be it! Once everyone has retired for the night, someone has to stay up and clean. If you decide to do it on your own, you will be up till the wee hours and it will be time for breakfast all over again. Get the kids to help out. While someone loads up the dishwasher, another person can sweep the floor. Someone else can put back the items scattered across the tables (for example, pieces you used for games) to their original position, remove the holiday decorations, and more. 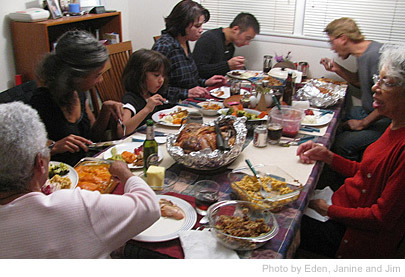 Having your family help you with the Thanksgiving dinner can save you a lot of headache. Show them your appreciation with their favorite leftovers!